Las Leñas behind the city of Mendoza. 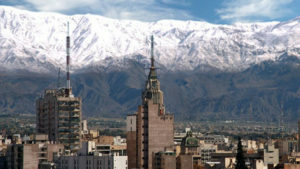 Las Leñas is located very close to the winter wonderland that is the city of Mendoza. It is of the largest ski resorts in all of Argentina and South America as well. It is also one of the best. It has been famous for tourists from all over the country and the world for its fantastic quality of snow. The snow is in a powdered form thus making this resort a haven for skiing enthusiasts. The resort has been around for the year 1983 and has gone through a lot of changes over the year. It is currently much modernized and some of the best equipment going around. But, it still has not lost any of its charms. 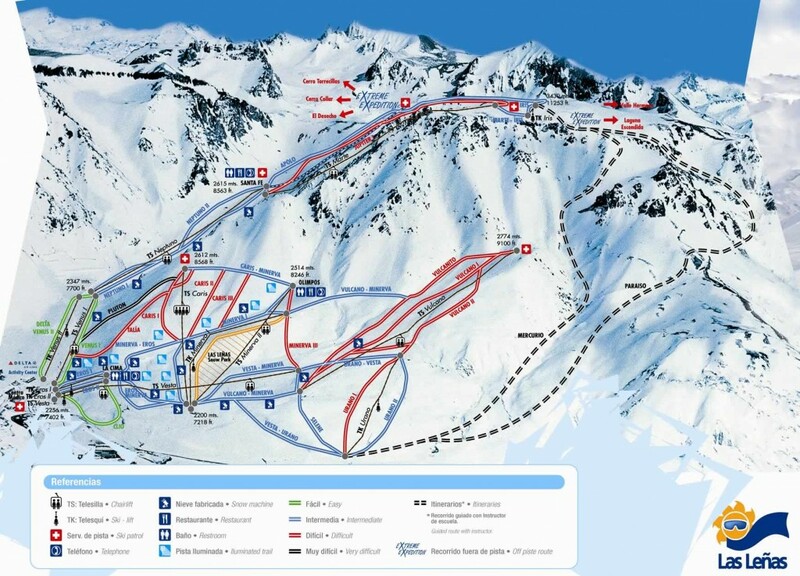 It is also famous for the 1200 meter long vertical slope, a reason why it is considered the Mecca for skiers by many. Apart from highly skilled professionals, this resort is also welcoming towards beginners and amateurs. That is because there 29 different trails in this resort and each of the different trails has a different personality to it. Some of them are simple and just ideal for beginners while others should not even be tried unless you are someone highly skilled in skiing. The resort boasts one of longest ski trails in the whole world and is a matter of pride for the locals. The trail is about 7 kilometers long, and it can be enjoyed by everyone from newbies to experts. This trail is a combination of three different trails, The Apolo, Venus, and Neptuno. All of these trails are beautiful to ski on and have fun in their own right. But together, they make one of the most scenic, spellbinding and fun ski trails on the entire planet. While the 1200 meter vertical slope is out of reach for the beginners, the resort has another long slope of 1000 meters with a very mild gradient for them to enjoy. There is also a 2000 meter long night trail, which is only accessible to highly experienced skiers. The opportunity to ski on this trail alone will make you want to ski more and more to attain a lot of experience. That is because of the sheer beauty of this trail. The entire trail is illuminated with golden light which makes it a sight to feast with your eyes. The warm glow of the lights is reflected by the snow, bathing the entire surrounding in a golden hue. If you visit Las Leñas during the season, it will never disappoint you with a signboard saying there is not enough snow to ski because the resort has a modern snowmaking system in place. This system consists of 30 snowmaking machines scattered all over the park. These machines make through an artificial process so that the resort is never devoid of its famous powdery white gold. Apart from the skiing, Las Leñas is also famous for the panoramic scenery it provides. The resort is situated in a valley sandwiched between the mighty Andes Mountains. So, whichever side you turn your head, you will be treated beautiful imagery. It is no wonder locals compare this place to a winter wonderland. If you thought this place just sounds perfect, you have not read the whole story yet. The mighty Andes mountains behind Las Leñas ski resort. If sceneries and skiing do not fascinate you, the resort also houses a commercial center and an institutional museum. The museum is a must visit if you are someone who is very intrigued by the history of the places you visit. The entertainment center has everything you need to keep you away from boredom if you do not feel like going out onto the snow for the day. Then, there is the Piscis casino, which is the highest located casino in the world. Ski all day and gamble your way to a fortune during the night. Sounds too good to be true does it not? But that is exactly what Las Leñas as in offer for you. If you are worried about food and accommodation, Las Leñas has you covered in that department as well. Accommodation and food are available both at the base and all around the resort. So, all you have to do is to pick a place and enjoy your stay in this man-made paradise.